Creepy is definitely the right word to describe him. Anyone reading the news this weekend are likely asking themselves, "Who is Slender Man?" and "What on Earth is Creepypasta?!"... and they have good reason to be both curious and concerned. Headlines today proclaimed that 16-year-old Anissa Weier of Milwaukee, WI, was sentenced to 25-years in a mental institution for the attempted second-degree homicide she was a party to in 2014, when she and friend Morgan Geyser, 15, lured another girl, Payton Leutner, into local woods, to "play hide-and-seek." Instead of taking part in an innocent game, however, Geyser viciously stabbed Leutner "everywhere" a total of 19 times, after which Weier suggested that she "lie down so she wouldn't lose blood so quickly," Geyser told her to stay quiet, and the two left her for dead. Fortunately, Leutner was able to crawl far enough out of the forested area to flag down a passing cyclist who called 911. She survived. "In order to please the Internet horror character Slender Man. Attorneys for Weier argued that she believed Slender Man would harm her family if she did not attack her classmate. According to the criminal complaint filed in 2014, one of the girls said, 'Many people do not believe Slender Man is real,' and that the girls 'wanted to prove the skeptics wrong.'" In a deal made with the state, both girls, set to be tried as adults, eventually pleaded guilty. A jury found Anissa Weier to be mentally ill and therefore "not criminally responsible for her actions," having been diagnosed with a delusional disorder. Morgan Geyser was found not competent to stand trial, having been diagnosed with early onset schizophrenia, from which her father also suffers. She is expected to be sentenced in February of 2018. The internet is replete with bizarre tales of ghosts, monsters and creatures who, while fictional, somehow seem to fully come to life online. Chief among these eerie creatures is the bizarre, and now, highly controversial figure known as, variably, "The Slender Man", "Slender Man" or "Slenderman." No matter how you connect the letters in his name, Slender Man has fast evolved into one of those iconic creations that takes on a life of its own, beyond the grasp of it's originator. Like most ghost stories or urban legends, his story has evolved, shifted and grown as it's been told and retold, mostly by pre-teens and adolescents in online chat rooms and forums. You may have seen photographs or drawings of him yourself, even if you hadn't realized what you were seeing at the time. He is always portrayed as unnaturally tall, thin and pale, dressed in a black suit, and and with no discernable hair or facial features. But unless you've done a deep dive into the world of his stories, that might be the extent of your knowledge about who he is and why real human children have committed heinous crimes in his name. In order to more fully draw the lines between fact and fiction, we've gathered the essential details of his origin story, his rise in popularity, and the ways in which his story continues to take shape to this day. Here are 9 essential facts about the Internet-based supernatural creation known as Slender Man and the evolution of his scary Creepypasta stories. 1. He was created in 2009 — in photoshop. Despite whatever your geek friends or the creepy kid next door tries to get you to believe, it's important that you know this before you know anything else. Slender Man is NOT real. He is a fictional character. On June 8, 2009, a photoshop contest was help among users on the Something Awful (SA) Forums, "a comedy website housing a variety of content, including blog entries, forums, feature articles, digitally edited pictures, and humorous media reviews." According to Know Your Meme, "The contest required participants to turn ordinary photographs into creepy-looking images through digital manipulation and then pass them on as authentic photographs on a number of paranormal forums." 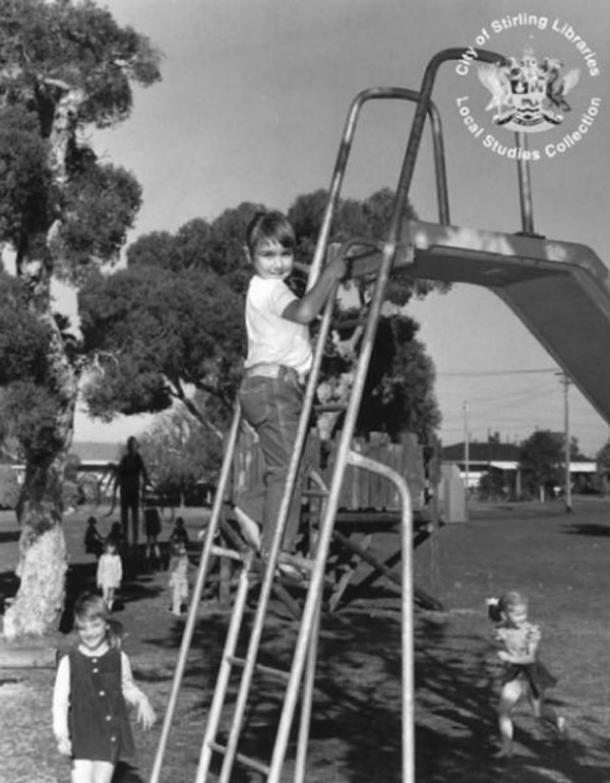 A man named Eric Knudsen, going by the username "Victor Surge", submitted these two black and white photos of children with a tall, thin, supernatural-looking figure photoshopped into the background, along with the captions shown below each. "'We didn't want to go, we didn't want to kill them, but its persistent silence and outstretched arms horrified and comforted us at the same time.' — 1983, photographer unknown, presumed dead." "'One of two recovered photographs from the Stirling City Library blaze. 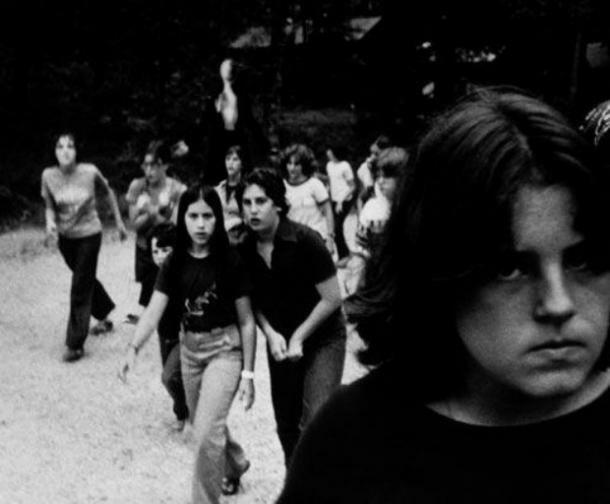 Notable for being taken the day which fourteen children vanished and for what is referred to as “The Slender Man”. Deformities cited as film defects by officials. Fire at library occurred one week later. Actual photograph confiscated as evidence.' — 1986, photographer: Mary Thomas, missing since June 13th, 1986." The photographs, the stories, and the idea of Slender Man himself went quickly went viral, gaining notoriety on fanfiction site Creepypasta and fan forums such as 4Chan, Unfiction Forums, Fangoria, Bungie, Facepunch, Wikibin, /x/enopedia, TVTropes, Kongregate, DeviantArt, SlenderNation, and Mythical Creatures Guide. 2. His enjoys abducting children and driving people insane. While no two stories about Slender Man are the same, for the most part they feature him stalking, kidnapping or generally scaring people, particularly children. Slender Man is said to enjoys initially stalking his victims for years, mentally torturing them before he decides the time is right to kill them. Over time, his stalking victims come to suffer from "slendersickness," which is characterized by nausea, nose bleeds, nightmares, hallucinations, memory loss, insomnia, coughing fits, and massive paranoia, all of which seem to be highly contagious, as those mostly associated to his current targets are the most likely to become his next. As stated on the Slender Man Wiki, "He is rarely, if ever, portrayed in a good or benign light and is generally understood to be a malevolent force." 3. He often takes on slave-like "Proxies." Slender Man accomplished a good deal of his "work" through the use of what are known as his "Proxies." These are "entities or people who are under the influence or control of the Slender Man (or the same force that influences Slender Man), and act based on its wants and needs- hence, Proxies serve as an in-between (i.e. a proxy) for Slender Man. It is suspected that Proxies do the actual, physical work for Slender Man, such as creating and manipulating objects, destroying and leaving evidence, creating videos and responding on Twitter (in ARGs), and influencing victims as needed." 4. He possesses magical abilities. Additional stories claim that Slender Man can control a person's mind, have an affect on electronic and digital devices, teleport and space/time warp, and perfectly trace his targets without being detected at all times, no matter how or where they hide. 5. He has a strikingly unique appearance. He is usually portrayed as a thin, unnaturally tall man with a bald head and entirely vacant face, wearing a black suit with a gray or white dress shirt underneath His height is central to his characterization, and most stories have him standing at eight-to-ten-feet-tall. He is often also described as having tentacles which he can hide or reveal at will. The tips of these tentacles are thought to be razor-sharp. 6. He has multiples incarnations. While Knudson may have created Slender Man, a massive canon has been built around his persona, including fictional stories, fan art, a "mockumentary" in the style of The Blair Witch Project, video games (Slender: The Eight Pages, Slender: The Arrival and Slender Rising), and more. A YouTube web called Marble Hornets was inspired by his character, and he was referenced in the wildly popular video game Minecraft, through the character of the "Enderman." 7. His entry into popular culture marked the beginning of digital folklore. Part of the success of the story of Slender Man is the fact that when Knudson created him, he and others worked hard to develop an origin story all of his own, establishing a highly-detailed "historical" timeline related to his "life" that predated his actual birth aforementioned photoshop contest by centuries. 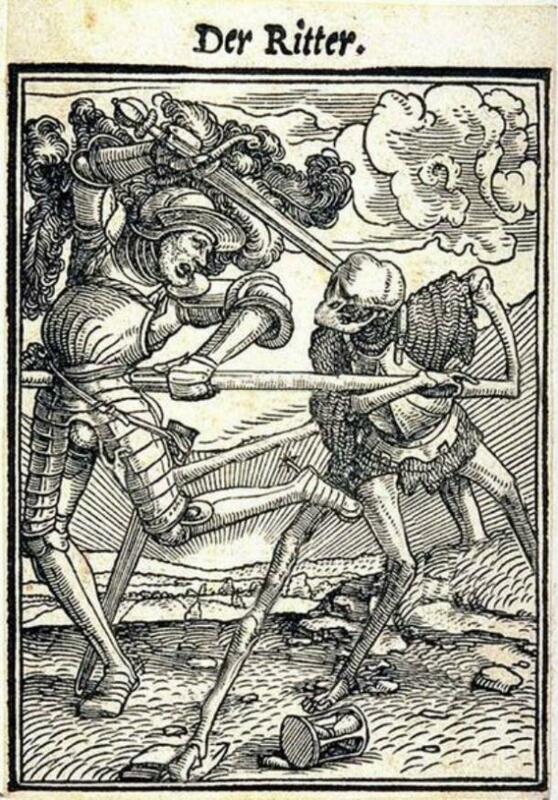 While we cannot repeat too often here that he is NOT real and has NEVER existed, "16th century art" referring to Der Großmann (i.e., The Tall Man), a skeletal figure with multiple legs and spear-like arms depicted in the act of impaling adults and/or stealing their children, managed to convince some people that he is real and that he does exist. Hopefully the third time will be the charm here. Because, once again, he is NOT and he NEVER was. 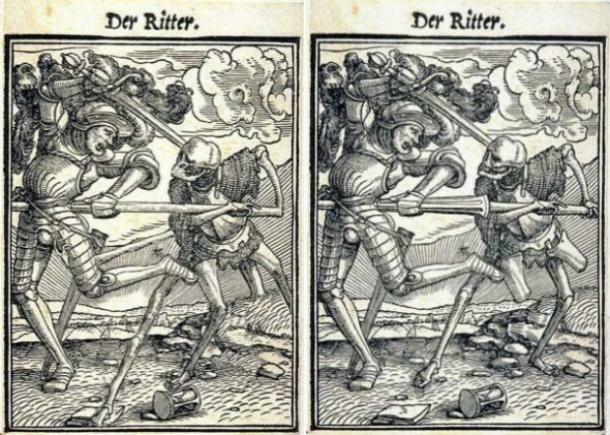 As revealed on Snopes, these "wood cuttings" are simply photoshopped versions of original wood block prints by the artist Hans Holbein, c. 1497. The story of Slender Man has quickly become one of the Internet's first "homemade" folktales for the Digital Age. 8. Tragically, Slender Man has been connected to serious real crimes. Slender Man himself may not be real, but that doesn't mean his fans, followers and admirers don't take him seriously, some so seriously, in fact, they simply cannot accept that he is an invention of one man's imagination. Weier and Geyser were both obsessed to the point that each reported having had dreams about him on a regular basis, and they firmly believed that by killing Leutner they would both become his Proxies, this preventing him from killing their own families. In 2014, a woman in Ohio reported that her 13-year-old daughter stabbed her in the neck with a knife, claiming she was motivated to kill her mother by Slender Man. Also in 2014, a teenage girl in Florida set her family home ablaze while her mother and younger brother slept inside. She was said to have been deeply interested in Slender Man. Thankfully, everyone survived. In 2015, a rash of teenagers and young adults on the Sioux Pine Ridge Indian Reservation committed suicide, with authorities linking Slender Man as an inspiration in at least some of the cases. 9. The people at Creepypasta want to remind you, again, that he is NOT real. Following the attack on Leutner, Joe Jozwowski, Creppypastanetwork administrator, issued a statement on the site, first offering his sympathy and prayers to all those involved in the incident, and then making the following points. Slender Man is not real. "SLENDERMAN IS NOT A REAL PERSON/ENTITY. As far as I’m aware, most news outlets have done their due diligence and thus no media personality is claiming that Slenderman actually exists, so I’m not exactly sure where people are getting this misinformation. However, I’m still seeing quite a lot of comments from people who believe that A) he is a real person and B) he owns and is responsible for every single Creepypasta-related website, tumblr, YouTube channel, Facebook group, forum, and wiki. This is simply not true. Slenderman is not, nor has he ever been, anything more than a fictional character created by SomethingAwful user Victor Surge. As is the case with many other fictional characters, he has fans who indulge themselves by creating videos, games, and fanfictions about him, but this does not make him real any more than such fandom would make The Walking Dead or Batman real." While he actually tries to limit the amount of contact based on serial killers because he finds much of it problematic, but far more important, he believes is increased mental health awareness. "I don’t believe that it’s the fault of Slenderman or horror writing in general that this happened. I remember reading scary stories and watching slasher movies when I was a child and young teenager and while they certainly gave me nightmares, they did not instill within me a desire to murder my friends..."
"We live in a culture with a very unhealthy relationship with mental illness. People with mental health issues are frequently dismissed (people who deal with anxiety, depression, etc have almost certainly experienced people telling them that their problems don’t exist and that they should 'bootstrap' and just 'get over it'), shamed and bullied (consider Miley Cyrus’ tweets where she mocked Sinead O’Conner for acknowledging her own struggle with mental illness and asking for help), and often ignored or denied necessary treatment because people either choose to look the other way when they see symptoms or their attempts to help are met with resistance because the sufferer has internalized all the negative cultural messages about having and admitting to mental illness." Parents, PLEASE watch what your children are doing online. 'Parents should not be allowing their children to have unrestricted or unmonitored internet usage — whether it be on their computer on their smart phone on their PlayStation. All of those accesses to the outside world,' Chief Jack said."